The Brain MRI (magnetic resonance imaging) is a painless, non-invasive radiology exam which is performed to examine the area of the head or brain. The visuals created by the MRI machine helps doctors identify tumors, infection, inflammation, optic or auditory nerve dysfunction, multiple sclerosis and assess parts of the brain controlling thought, speech, movement or sensation. The MRI scan is different in comparison to the X-ray and CT scan because it does not use radiation for producing images. A combination of images in a MRI scan create a 3D picture of the patient’s internal structures making it easier to detect abnormalities in small structures such as the brainstem and the pituitary gland. However, to identify certain abnormalities, sometimes, a dye or contrast agent is given to the patient intravenously. Alternatively, doctors also suggest a functional MRI (fMRI), MRA (magnetic resonance angiography) or CT Scan: Head and Brain depending upon the symptoms and condition of the patient. What is the procedure for a Brain MRI? It is very important to stay still during the MRI exam. The patient undergoing an MRI has to lie down still on a table that slides towards the MRI machine. The table will slide through a large magnetic scanner. Once the table is inside the scanner, the MRI technician will take pictures of the patient’s brain. The MRI machine will also have a microphone present inside making it easier for the patient to communicate with the staff. During the procedure, the MRI machine tends to make loud banging noises. The patient will be offered ear plugs to block out the noise. The complete test takes 30 – 60 minutes. Some patients are also given a contrast solution, which helps the test reflect certain parts of the patient’s brain easily, especially the blood vessels. What kind of MRI should I opt for? Brain MRI with contrast or without contrast? The doctor will decide if the patient requires contrast. If required, then the contrast will either be given through an IV or orally. The procedure for the MRI remains the same, with or without the contrast. Any other type of iron-based metal implants. MRI is also contraindicated in the presence of internal metallic objects such as bullets or shrapnel, as well as surgical clips, pins, plates, screws, metal sutures, or wire mesh. 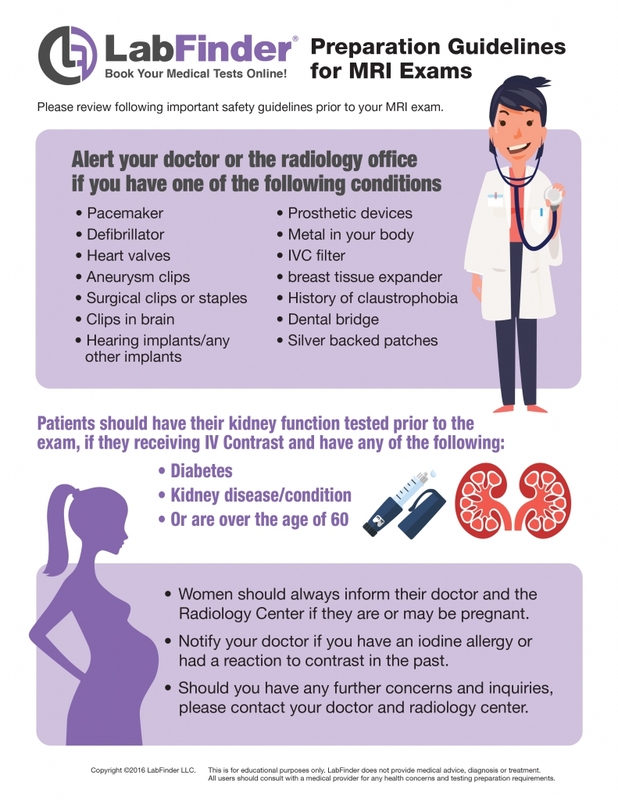 If you are pregnant or suspect that you may be pregnant, you should notify your physician. Due to the potential for a harmful increase in the temperature of the amniotic fluid, MRI is not advised for pregnant patients. If contrast dye is used, there is a risk for allergic reaction to the dye. Patients who are allergic to or sensitive to medications, contrast dye, iodine, or shellfish should notify the radiologist or technologist. MRI contrast may also have an effect on other conditions such as allergies, asthma, anemia, hypotension (low blood pressure), and sickle cell disease.